News on progress on forthcoming books and events. This is a very exciting new project that came to us from decorative painter and author John Sutcliffe. John's vision for the book is a survey of the colours to be seen on the exteriors of buildings in Rome's centro storico, colours that are very different from those of Venice, Tuscany, or Palermo. If you know our books you will know we love colour, so this was a project that appealed from the outset! John visited Rome recently and wrote 'Every morning I set out laden with paint and other kit to find & copy the severest browns, the brightest ochres & stoniest stone colours. 10 days - 20 colours. The palette is of course all the great earth colours - ochres, siena, umbers, Venetian red.' The colours we see in Rome today have their own history and background, and are characteristic of the place, the geography, and the light. Even different elements of the facade of a building can be treated differently, as well as railings, shutters, and the like. The colours themselves are applied as traditional finishes in the form of lime-washes and distempers mixed from perhaps eight basic earth colours. Our current plan is to illustrate these and those twenty colours John found in the streets of Rome; there must of course be lots of colour in the book so we shall be incorporating examples using acrylics applied directly onto the page as well as a folding colour swatch card. We are also working on the idea of a small number of de luxe copies which will come with bottled samples of the raw pigments themselves. No doubt Italian papers will appear somewhere in the book. Edition size and price are a long way from being decided but you will be able to follow the design process via future e-newsletters. This has now been published. 175 copies. £125 (€160, US$220). Shipping at cost. Full details at our website. I rather surprised myself by managing to get this title printed this year as well as the other book on the Daniel Press and, moreover, to have it ready for sale at the Oxford Fine Press Book Fair. There are 24pp of 12pt Caslon printed on a Turkey Mill wove and a dozen full page colour photographs of some of the proof sheets described in the text. 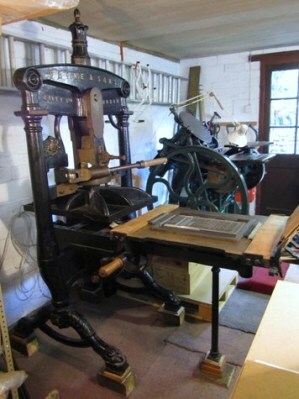 The binding is uniform with The Daniel Press in Frome. You can view both books here - you will see that they have been bound to match Falconer Madan's bibliography of the Daniel Press. The edition is just 95 copies. The price is £84 (E110, US$150) per copy. Shipping at cost. I also managed to print the announcement and will be sending that out in the New Year, perhaps with one for The Colours of Rome. Full details are of course now available at our website and you can place an order there. I have always felt that one needed three presses: a platen for small items, a large press for working with big pieces of paper, and a hand-press . . . just because. So it's a real pleasure to have made space in the print-shop for a fine Albion in great condition. It's an even greater pleasure that it came from Oxford University Press, and was probably used for proofing in Top Comps (where specialist hand-setting was done) or possibly the Type Foundry. It's a Royal and dates (I think) from about 1890. Patrick Roe and Scott Davis manoeuvred it in and set it up. The C&P had to be moved from where it has stood for about twenty years to make space. American hand-press printer Steve Heaver kindly helped me get started, in particular re-covering the tympan and frisket (both of which were there and covered but rather dirty and tatty) and preparing basic packing. Much to do now to get ready to print on it. A big inking roller, platen bearers and points, roller bearers, etc etc. Then the journey begins . . .
Do you send out mailings by post to groups of people who are potential members of the FPBA? Would you be willing to include a flyer for the FPBA in a mailing? If so, please contact me and we can discuss. The flyer weighs but 8gm. And are you a member yourself? If not, do join at www.fpba.com. You are missing a real treat if you don't get the twice-yearly journal Parenthesis. I have a complete run of the Newsletter of the Society of Wood Engravers from its revival in 1987 to the change of format in 2008. A few of the earlier copies are photocopies. All in VG condition. They occupy the same space as about five reams of A4 and weigh as much. I'm open to offers. On Friday next week I shall put in the recycling a stack of catalogues from the likes of Maggs, Barnitt, Larkhill, and Monk Bretton - unless they are of interest to someone.